The Great Barrier Reef off the coast of Australia is full of beauty and adventure. Here are plenty of reasons you need to visit! There are many ways to experience the Great Barrier Reef. Some visitors prefer day trips aboard larger vessels like Ocean Spirit Cruises, which can accommodate a variety of ages and swimming capabilities. On the other hand, there are travelers like myself who have a burning desire to journey farther and dive deeper into this UNESCO World Heritage Center. The family-owned Coral Sea Dreaming succeeds in delivering this niche with fantastic 2-day, small group excursions. We set out early in the morning from Cairns, Australia with Captain Jan at the helm of his 52-foot yacht. Jan is the co-owner of Coral Sea Dreaming, a company he founded with his wife, Claire. She is responsible for the company’s attractive mermaid logo, which adorns the vessel with wooden carvings and other depictions. 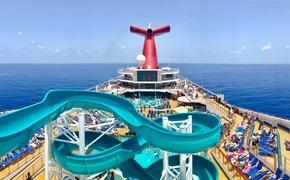 The vibe onboard is pretty laid back. As we sailed, we chillaxed to Jan’s finely tuned playlist, which includes music by artists like Portishead, Outkast, Sublime and Bob Marley. There are places on deck where guests can lay in the sun or even take a nap in the hammock. I spent most of most of my time socializing with other passengers in a shaded area that doubles as the ship’s bridge. It’s here we were able to chat with Captain Jan as he commandeered the steel yacht. It’s clear he knows the vessel and waters like the back of his hand. And why shouldn’t he? For years, he worked onboard before he and his wife inherited it from the previous owner. While Jan has a more hands-on role with Coral Sea Dreaming, Claire works behind these scenes managing the business aspects. One responsibility they share is caring for the newest member of their family, a child who will no doubt grow up to be a scuba diving, sailor extraordinaire. The atmosphere of family comradery extends to their vessel, which can only accommodate a maximum 12 passengers per tour. Coral Sea Dreaming requires three crew personnel to operate, which means a favorable 4:1 ratio of passengers to crew. This small group setting inspires a more intimate experience and is the closest one can get to sailing on a private charter or semi-private yacht without the hefty price tag. The tour is ideal for singles or couples, as well as families or groups up to twelve people. The only drawback is that, due to the small size of the vessel, Coral Sea Dreaming is unable to accommodate individuals with mobility issues. This tour is not ideal for non-swimmers, either, and is unsuitable for children under four years of age. There were only six passengers onboard when we set sail, resulting in an even more favorable ratio of 2:1. I couldn’t have asked for a better scenario. Due to a medical condition, I must take extra care and only participate in supervised dives. The small group setting is perfect for beginners, as well, who are emboldened to receive undivided attention from instructors and eager to try scuba diving for the first time (complimentary trial dive included). Both first time and certified divers are inspired by Cindy, the PADI educator onboard with an outgoing personality and undeniable passion for diving. While Coral Sea Dreaming’s focus may be on diving, the voyage is conducive for snorkeling as well, gear included. Since we were spending two days at sea, we had the freedom to visit less trodden parts of the reef. Sailing at a maximum nine knots, Coral Sea Dreaming accesses parts of the Great Barrier Reef that are void of the traffic created by larger vessels. Away from the coastal areas, these sites are better preserved. It’s where pristine conditions allow coral to be most vibrant, encouraging the wildlife that’s made the Great Barrier Reef famous. It took four hours from Cairns to reach Milln Reef. We stopped at a site called Three Sisters, which is comprised of subsites called Three Pinnacles. As I snorkeled, I was surrounded by a living sea of aquatic species including Butterfly Fish, Coral Groupers and Angel Fish. Looking down at the ocean floor, I spotted a Blue Spotted Sting Ray nestled in the sand. The crew told us the best time to encounter turtles is before sunset when they come up for one last gulp of air before finding a place to settle for the night. The turtles are curious and swim right up to the boat. I befriended a Green Sea Turtle and followed him across the reef while capturing the encounter in a GoPro video. It seemed unfazed by my company and, as we floated along, the turtle stopped to snack on seaweed and to breach the surface. Coral Sea Dreaming offers night dives for those who are certified, but I was exhausted and opted to retire. My private cabin was cozy. I slept in a double size bed with the company of a mermaid mural over my head. Onboard accommodation includes private cabins with double beds, a semi-private quad single share cabin and a bunk bed. The next morning, we traveled to another site called The Whale, comprised of subsites that include The Whale Boomie and a wall. Cindy supervised as I scuba dive. About thirty feet deep, we spot Clown Fish frolicking among the anemones, a species that’s come to be more commonly known as “Nemo”. It was my last encounter before lunch (all meals included), after which we embarked upon our return voyage to Cairns, fully content with our deep dive into the Great Barrier Reef.